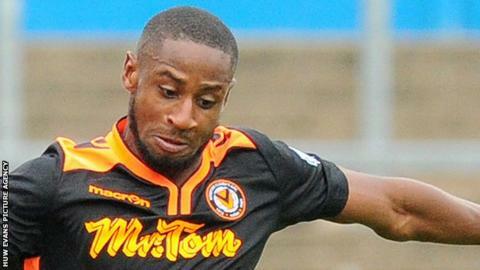 Newport County are waiting to discover the extent of on-loan defender Janoi Donacien's ankle injury. Donacien, on loan from Aston Villa, was taken off on a stretcher after losing his footing during the first half of the 2-2 draw at Accrington Stanley. The 22-year-old left the Crown Ground on crutches and is set to have a scan on the injury. "He looks a bit sore and he could be out for a while," manager John Sheridan said. "We don't want it to be serious but he's in a bit of pain and we'll have to assess him." Sheridan's side extended their unbeaten run to five games in League Two with a 2-2 draw at high-flying Accrington on Saturday. Newport twice led through goals from Yan Klukowski and Scott Boden, before Matt Crooks rescued a point for Accrington. "It's a shame we didn't hang on," Sheridan said. "It was a good solid performance and that will be a good point hopefully come the end of the season. "I'm getting quality performances, which gives you a better chance of winning games." Newport host Brackley Town in the FA Cup first-round replay on Tuesday and are home to fellow League Two strugglers Yeovil Town next Saturday.